The following article was commissioned by us to compare Simple:Press to two SaaS style Forum Services. Other than providing access to a demo site for Simple:Press and editing for grammar, we had no substantial input into the review you’re about to read below. The author’s bio (Colin Newcomber) and contact information appears at the end of the article. In this article, we’ll go in-depth into three tools that help you create a forum on WordPress sites. 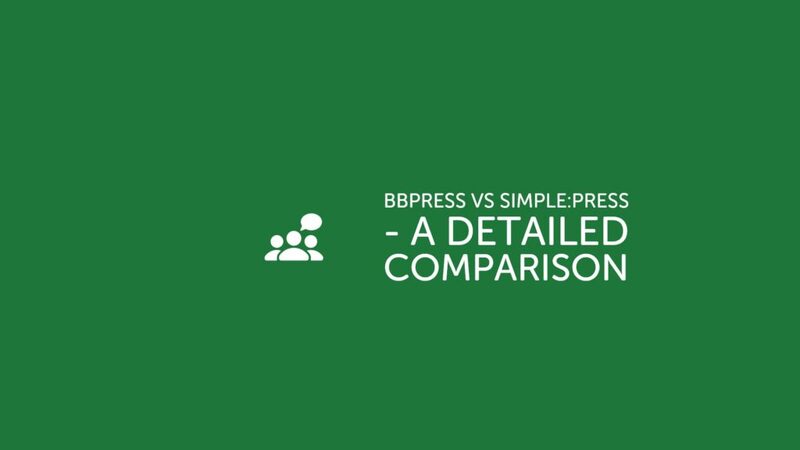 We’ve already compared Simple:Press to other WordPress plugins so this article will compare it to a couple of SaaS Services. We should point out that there are a few other SaaS forum providers out there such as Vanilla Forums. However, they all have similar benefits or drawbacks as Discourse and Forumbee so there didn’t seem to be any need to include additional ones in this comparison. As far as the ones covered in this article are concerned, we’re not going to pick a single “winner” for 100% of situations – that wouldn’t be honest. Instead, we’re going to highlight the strengths and weaknesses of each tool and approach so that you can find the one that’s right for you. Before we get into our hands-on Simple:Press vs Discourse vs ForumBee comparison, let’s do a quick run-down on the basics of each solution. Simple:Press is a popular WordPress forum plugin that’s been around since 2006. You’ll self-host it, along with WordPress, to run your forum. Because of its self-hosted nature, Simple:Press is the most flexible tool on this list, though you sacrifice some ease of use and simplicity to achieve that flexibility. ForumBee is a hosted, SaaS forum solution. While it can be pricey and lacks the flexibility you’d get with something like Simple:Press, the upside is that it’s easy to use, simple, and has great-looking frontend and backend interfaces right out of the box. When it comes to the ease of setting up your forum, the SaaS tools offer a simpler setup process. With something like ForumBee or Discourse, creating a forum is basically as easy as registering for an account and filling in some basic information. However, with a WordPress forum plugin like Simple:Press, you’ll need to get your own hosting, install the WordPress software, and then install and configure the Simple:Press plugin. To get started with Simple:Press, you’ll first need to have a working install of WordPress. Thanks to WordPress’ popularity, that’s pretty simple nowadays. If you choose a managed WordPress host, they can install WordPress for you so that you’re ready to go right away. With Discourse, you’ll get started by registering for an account. During that process, you’ll also choose your desired domain name. Once that’s done, Discourse will set up your forum for you and send you an email when it’s ready to go. After that, you’ll have a working forum right away. With ForumBee, you’ll also get started by simply registering for an account. Then, after you confirm your email, it will drop you straight into the ForumBee dashboard for your community. In this section, we’ll compare the looks and design of two important areas of your forum. First, we’ll look at the options you have for controlling how your forum looks to visitors. Then, we’ll cover what the backend interface looks like, which is where you’ll spend a lot of time administrating your forum. For each theme, you can choose a color overlay to further control the color palette. In terms of the backend aesthetics, the actual Simple:Press interface looks a little dated, especially in comparison to Discourse and ForumBee. Discourse lets you choose from some basic themes and color palettes during the setup wizard. In terms of the backend management interface, Discourse isn’t fancy, but it’s quite functional. The only negative is that sometimes the lengthy settings lists can feel a little overwhelming. In terms of the backend interface, ForumBee definitely has the nicest dashboard of all three tools. ForumBee’s backend also avoids the “settings overload” that Discourse can have. In this section, we’ll compare the core functionality that each tool offers. Because Simple:Press was launched all the way back in 2006 and has been in continuous development, it’s built up a lengthier feature list than both Discourse and ForumBee, which are comparatively young solutions. The free core Simple:Press plugin is already comparable to the functionality that you get with Discourse and ForumBee. However, where Simple:Press becomes even more flexible is with its 70+ premium add-ons. Users can subscribe to content by topic, keyword, etc. Again, these are just a small slice of the 100+ features that you can add with Simple:Press’ 70+ add-ons. View a full list of all the add-ons. And, as if that’s not enough, it seems as if they have an aggressive development schedule for new functions – their blog has a number of “coming soon” announcements for things like an Ads Plugin and a heavy-duty Analytics Plugin. They even have a Survey for their customers to decide what they should build next! And you’ll also get helpful admin features like bulk moderation and a moderator flag queue. However, unlike Simple:Press and Discourse, there’s no plugin system that you can use to further extend ForumBee’s functionality. So if you just need a basic forum, you might be fine with what ForumBee offers – but don’t expect to have access to more niche functionality. While SaaS forum solutions have the advantage when it comes to the ease of use and setup process, the pricing plan is where you’ll pay for that convenience. With a WordPress forum plugin like Simple:Press, however, you’ll pay the same flat rate whether you have one hundred members or one hundred thousand members. Additionally, that flat rate is just plain lower than SaaS tools. Simple:Press offers a free core version of the plugin, so you have the option of getting started with a basic forum for free. If you want more functionality, you can purchase individual extensions or get a bundle. The bundles start at $99 per year and top out at $199 per year. So even if you want every single premium feature and theme, you’ll still pay a max of $199 per year for the forum functionality. Of course, because Simple:Press is a self-hosted solution, you’ll also need to pay for your own WordPress hosting. These prices will vary depending on the size and traffic of your community, but cloud hosting providers have made it possible to host robust WordPress sites for as little as $5-10 per month. Discourse’s cheapest hosted plans start at $100 per month for 100k monthly page views and 10GB storage. So to use the SaaS version of Discourse, you’re looking at $1,200 per year minimum, with higher costs as you grow. ForumBee’s cheapest plan starts at $49 per month, but that will only allow you to have 100 members and 5 categories at your forum. If you need to exceed that – which most forums will – the next tiers up are $99 or $199 per month. So again, even if your forum has fewer than 100 members, you’re still paying at least ~$600 per year, which is a pretty big premium over a WordPress forum plugin like Simple:Press which tops out at $199. With a forum, it’s normal that you’ll want to offer different access levels for different forums and users. In this section, we’ll compare how each tool lets you do that, and how deeply you can customize these permission rules. With its customizable Permissions system, Simple:Press gives you full control over exactly what each member can do and what they can access. To help you manage what users can and cannot do, Discourse comes with 5 different “trust levels”. As users interact with your forum, their trust level will naturally increase (learn more here). To control access to your forums, you’ll use these trust levels, along with basic criteria like “admin” or “moderator”. The user permissions that ForumBee gives you access to depend on your plan. On lower-tier plans, you have the option to make your entire community public or private, but you cannot set these options on a forum-by-forum basis. That is, you either make everything public or everything private. Like the setup process, updates are another area where SaaS forum tools like Discourse and ForumBee come out ahead of Simple:Press. Because of their hosted approach, both Discourse and ForumBee will handle updates for you, which means you never need to think about updating your forum software. On the other hand, with a self-hosted WordPress site and Simple:Press, you’ll be responsible for keeping both the core WordPress software and Simple:Press up-to-date. The actual update process for both is simple – you basically just click a button. However, you will have to check for potential compatibility issues after updates, which is something you won’t have to do with either Discourse or ForumBee. We kind of touched on customization in the functionality section above, but let’s cover it in a little more depth because it deserves its own section. 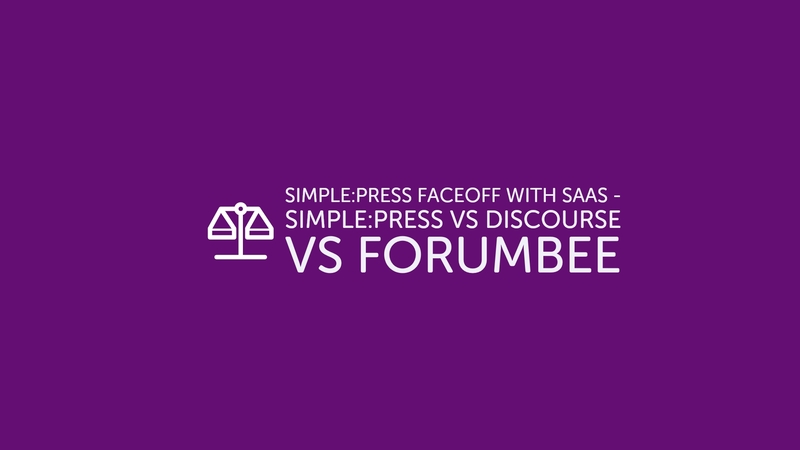 When it comes to having the ability to customize your forum, using a self-hosted WordPress solution like Simple:Press will offer more flexibility than SaaS tools like Discourse or ForumBee. See, with a SaaS tool, you’re pretty much limited to the features that the developer(s) give you. However, when you go with a WordPress forum plugin like Simple:Press, you also get access to the full flexibility of the WordPress platform, which lets you directly edit source code and integrate the 50,000+ other plugins that can enhance your forum. For example, if you wanted to integrate a merch store into your forum, you could do that right from your same WordPress install, rather than needing a separate solution like you would with Discourse or ForumBee. With Simple:Press and WordPress, the sky is pretty much the limit when it comes to customizations. If you want to add a new feature to your site, you can first check for a pre-made WordPress extension which, because WordPress powers 30%+ of all websites, probably exists. If it doesn’t, you can always hire a developer to custom code it for you because you have access to all the source code powering your community. Discourse is more flexible than your average SaaS, but won’t give you the complete flexibility of WordPress and Simple:Press. When you edit a theme, you can add your own HTML/CSS, which lets you make front-end customizations. However, if you want to make bigger tweaks, you’ll probably need a plugin. But…unless you’re on Discourse’s Enterprise tier, you can’t install your own Discourse plugins with the hosted version of Discourse. As such, you’ll be limited to only the plugins that Discourse offers. ForumBee is the least flexible forum tool because there’s no plugin system. You’re pretty much limited to the core ForumBee feature list, with very little option for customizing on top of that beyond style tweaks. If you care about data ownership and privacy, where that data resides should be an important consideration when choosing your forum solution. With Simple:Press, you have 100% control and ownership over your data because it all sits inside your WordPress database stored on your server. At any time, you can export your data in any format you want. Additionally, you can control your backup frequency, using either a WordPress backup plugin or tools from your web host. For example, the UpdraftPlus backup plugin lets you automatically back up your forum’s database to an offsite location on a schedule that you choose. So if you want, you could easily create a full database backup every hour and store it on AWS or another cloud storage provider. With hosted Discourse, your data resides on Discourse’s servers, rather than your own. However, Discourse does a much better job of giving you access to this data than ForumBee does. This is pretty generous for a hosted SaaS solution, but still doesn’t give you full control like you have with Simple:Press. ForumBee is the least flexible of these three tools when it comes to data ownership. Not only does the data reside on ForumBee’s servers, but there’s no way to manually export or back up your data from the ForumBee dashboard. You can get a full data export, but you’ll need to contact ForumBee support to do so, which makes it impractical to take your own regular backups. When it comes down to Simple:Press vs Discourse vs ForumBee, which one should you choose? Well, that really depends on your needs. There’s no single solution that’s right in 100% of situations. When it comes to ease of setup and simplicity, a SaaS tool like Discourse or ForumBee is going to be the winner. Because of their hosted approach, you’ll never have to fiddle with installing software, running updates, securing your community, etc. That’s really the big benefit of going with a hosted, SaaS solution. First, there’s the literal cost – both platforms will cost significantly more than hosting Simple:Press yourself. At a minimum, you’d be paying ~$400 more per year for ForumBee, and that’s for a community with a maximum of 100 members. Of course, you will need your own hosting on top of purchasing Simple:Press, but that won’t even come close to making up the difference, especially for larger communities. With a SaaS tool, you can only customize what the developer lets you customize, whereas Simple:Press lets you make direct code edits and gives you access to the huge library of third-party WordPress extensions. Beyond that, there are data ownership issues. With Discourse or ForumBee, all of your forum data sits on their servers (though Discourse does make it easy to export), whereas with Simple:Press everything is stored on your servers. If you value simplicity and convenience the most, consider a SaaS tool like Discourse or ForumBee. However, if you want full control over your community’s functionality and data, as well as to save money, you’ll be happier with Simple:Press.